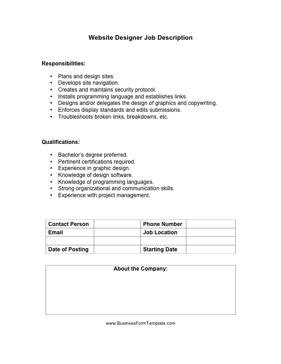 Tech companies and computer programmers can use this website designer job description to advertise for graphic design position. Creates and maintains security protocol. Installs programming language and establishes links. Designs and/or delegates the design of graphics and copywriting. Enforces display standards and edits submissions. Troubleshoots broken links, breakdowns, etc.